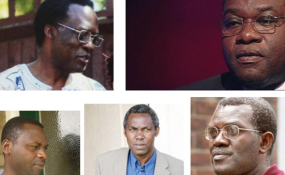 Clockwise: Celestin Mutabaruka, Dr Vincent Bajinya, Emmanuel Nteziryayo, Celestin Ugirashebuja, Charles Munyaneza. Five key suspects of the 1994 Genocide against the Tutsi currently on British soil have been placed under fresh investigations, UK Metropolitan Police has told The New Times. Eleven years ago, Rwanda issued indictments detailing the crimes the five men - all of whom held key leadership positions under the genocidal regime - allegedly committed during the Genocide but following several rounds of arrests and hearings the UK judiciary released the suspects, arguing they may not get fair trial if extradited to Rwanda. The suspects are Dr Vincent Bajinya, Célestin Ugirashebuja, Charles Munyaneza, Emmanuel Nteziryayo and Célestin Mutabaruka. Kigali protested their release saying it perpetuated impunity and denied justice to victims. The Rwandan government urged the UK to try the fugitives on its soil if it was uncomfortable with extraditing them to face trial in a country where they allegedly committed the crimes. But in a new twist, the UK Metropolitan Police says they were now assessing the indictments against the five men under their War Crimes Unit. In an email to The New Times, a Metropolitan Police spokesman said: "We can confirm that the Met's War Crimes Unit, within the Counter Terrorism Command, received a request from Rwandan authorities in January 2018 to investigate five individuals in the UK in relation to alleged genocide offences in Rwanda dating from around 1994." "Documentation relevant to this request has been passed to the War Crimes Unit, and the unit is currently assessing this material," the email reads in part. The development comes hot on the heels of a meeting between the new UK envoy to Rwanda, Joanne Lomas, and Rwanda's Justice minister and Attorney General Johnston Busingye. Shortly after the meeting last week, Lomas told the media that fresh investigations into the case were underway, adding that her country took the issue "very seriously". Observers have questioned the indifference of UK authorities on the indictments against the five men, with fresh criticism gathering momentum in the early days of the ongoing 24th commemoration of the Genocide against the Tutsi. More than a million people were killed during the Genocide. During a commemoration event in London last week, Rwanda's High Commissioner to the United Kingdom, Yamina Karitanyi, said Rwanda "will not tire" in using the law, and diplomacy, to fight genocide ideology and bringing (Genocide) suspects who are still at large to face trial." Rwanda has over the years received fugitives from different parts of the world, including from Europe and the Americas, as well as referrals from the International Criminal Tribunal for Rwanda. This, Rwandan officials, say disqualifies claims that that the fugitives in the UK would not get fair trial once extradited to Rwanda. But the officials in Kigali have also said that any country that was not willing to hand such suspects to Rwanda should go ahead and hold them accountable for their crimes as provided for under the international law. The five fugitives residing in the UK include Bajinya, a medical doctor who at the time of the Genocide headed the then National Population Office (ONAPO). He is said to have been a coordinator of a militia in the capital Kigali, with several witness accounts alleging that he organised regular meetings in his home in the days preceding the Genocide where plans to kill the Tutsi were hatched. The other one is Celestin Mutabaruka, presently a Pentecostal preacher in the UK. Mutabaruka, who at the time of the Genocide was running Crête Zaïre-Nil (CZN), a forest management organisation in Musebeya, southern Rwanda, is accused of having led a gang of killers that murdered many people on Muyira Hill in Bisesero in mid May 1994, among other atrocities. The other three - Charles Munyaneza, Emmanual Nteziryayo and Celestin Ugirashebuja- were bourgmestres (mayors) for the communes (districts) of Kinyamakara, Mudasomwa and Kigoma, respectively, all in southern Rwanda. Munyaneza and Nteziryayo, whose communes fell under what was then Gikongoro prefecture, are accused of giving orders to exterminate over 50,000 Tutsi who had sought refugee at Murambi technical school during the Genocide. Ugirashebuja is accused of commanding Interahamwe militia to kill thousands of Tutsi in his commune, according to witness accounts. Rwanda first notified the UK government of the presence of these suspects on its soil back in 2007 when they issued indictments. An extradition battle ensued with Rwanda winning the first case in 2008 before the suspects appealed on the ground that they would not get fair hearing in Rwanda, with an appeals court ruling in their favour in 2009. Rwanda made a fresh extradition bid at Westminster Magistrates Court in 2013 following judicial reforms but again it lost on the basis that the cases were politically motivated and not genuine pursuit of justice for genocide crimes. These claims are "unfounded", Minister Busingye told journalists after his meeting with British High Commissioner Joanne Lomas in Kigali last week. "The reasons upon which the British judicial system has based on to say that these people will not receive fair trial are unfounded. "The British judicial system should interrogate this issue further because many countries across the world have extradited Genocide suspects to Rwanda and we have not had the fears expressed by the British justice system justified in any of those cases," Busingye said. Some of the countries that have extradited or deported fugitives to Rwanda include Canada, Germany, Norway, Denmark, the Netherlands and the United States. In January 2018, Prosecutor General Jean Bosco Mutangana and Jean Bosco Siboyintore, the Head of Genocide Suspects Tracking Unit at the National Public Prosecution Authority, travelled to London where they delivered a fresh request for the UK to prosecute the five Genocide suspects. "UK has two obligations; if you can't extradite them, prosecute them, in any case let them face justice because there is proof for their crimes," Siboyintore told The New Times yesterday. Asked if the UK authorities were doing enough to bring these suspects to justice, the Metropolitan Police spokesperson said "we have nothing more to add at this stage but can only confirm fresh investigations into these files".